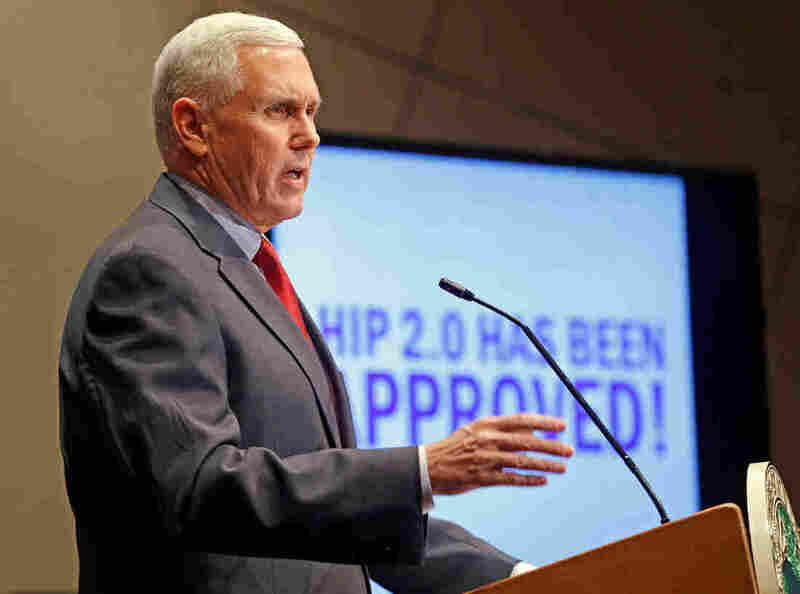 Indiana Seeks Federal OK To Renew Medicaid Expansion : Shots - Health News The home state of Vice President Mike Pence has asked the federal government to approve an extension of its carrot-and-stick approach to Medicaid that was made possible by the Affordable Care Act. As Indiana Governor, Mike Pence announced in 2015 that the federal Centers for Medicare & Medicaid Services approved a waiver for the state's Medicaid experiment. As Congress weighs repeal of the Affordable Care Act, the home state of Vice President Mike Pence Tuesday sought to keep its conservative-style Medicaid expansion under the federal health the health law. Indiana applied to the Trump administration to extend a regulatory waiver and funding until Jan. 31, 2021, for its package of incentives and penalties that are intended to encourage low-income Hoosiers on Medicaid to adopt healthful behaviors. Beneficiaries pay premiums, get health savings accounts and can lose their benefits if they miss payments. Though Pence now supports the health law's repeal, the Healthy Indiana Plan that he established in 2015 as the state's governor has brought Medicaid coverage to more than 350,000 people. The architect of the plan was health care consultant Seema Verma, who has been nominated to head the Centers for Medicare & Medicaid Services. Without Trump administration approval, federal money for Indiana's expansion will run out Jan. 31, 2018. Indiana officials said the Medicaid expansion would continue even if Washington follows through on a Republican proposal to distribute federal Medicaid funds through a block grant program that would give states more flexibility in setting benefits and eligibility levels. State officials refused to say whether the expansion would continue if Congress repealed Obamacare and eliminated funds for Medicaid expansions. If that happened, it's unlikely states would have the money to make up for the lost federal aid. Indiana's effort to continue its Medicaid expansion demonstrates how states that expanded Medicaid under the Affordable Care Act — even Republican-controlled ones — are counting on additional federal dollars to pay for those expansions. It also reflects deadline pressure: They can't wait for Congress to finish its debate over the future of the health law because they need to set budgets and programs now for next year. According to Indiana's request, continuing the Medicaid expansion will cost Indiana $1.5 billion but bring $8.6 billion in federal funding from 2018 to 2020. "Indiana has built a program that is delivering real results in a responsible, efficient, and effective way," Gov. Eric Holcomb, a Republican, said in a statement. "I look forward to maintaining the flexibility to grow this remarkably successful tool and to preserve our ability to respond to the unique needs of Hoosiers." Several other states including Kentucky and Ohio are considering adopting features of Indiana's Medicaid plan. Tuesday's filing continues most core elements of the Healthy Indiana Plan, but also expands beneficiaries access to substance abuse treatment and adds incentives for members to quit smoking, use chronic disease management programs and take part in voluntary job referral and training programs. "Certainly I think the new administration would give the waiver a friendly reception," said Joan Alker, executive director of the Center for Children and Families at Georgetown University. "But again that doesn't answer the question about whether the money is going away," if Congress repeals the health law and the Medicaid expansion. "It's an outstanding program that I hope folks on both sides of the aisle see it is a way to save and help people who truly need it, and it can be replicated," Brooks said. Some Republican plans to scrap and replace the Affordable Care Act don't include a Medicaid expansion. Republicans have argued for years that the Medicaid program is broken and non-disabled adults who gained coverage under the expansion should not be covered. Holcomb isn't the only Republican governor counting on Medicaid expansion and the additional federal funding continuing at least through 2018. This story was produced through a collaboration between NPR and Kaiser Health News, an editorially independent program of the Henry J. Kaiser Family Foundation, a nonpartisan health care policy research organization. You can follow Phil Galewitz on Twitter: @philgalewitz.